In the coming days, the Federal Reserve will release the results of the annual Comprehensive Capital Analysis and Review (CCAR), better known as “stress tests,” for the largest bank-holding companies (BHCs) in the U.S. The regulation requires top-tier BHCs with total consolidated assets of $50 billion or more to submit capital plans based on adverse scenarios. Plans were required for submission on January 9, 2012. The Federal Reserve is expected to release results by March 15. 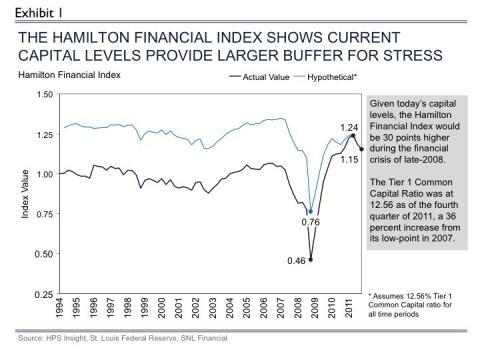 Even prior to knowing the results of the tests, there are ways to assess the strength of banks and understand what has changed since the crisis.ﾠ As outlined in the new Hamilton Financial Index (The report was commissioned by the Partnership for a Sound Financial Future and can be read here), capital levels for U.S. financial institutions are at an all-time high, and the level of risky assets has diminished considerably since the crisis. For further reading and insight in to the Fed’s stress tests, please readﾠfull client note here.